Grantmakers with an interest in food and health can identify a very wide range of nonprofits working to elevate the public’s understanding of food inequity and eliminate barriers. 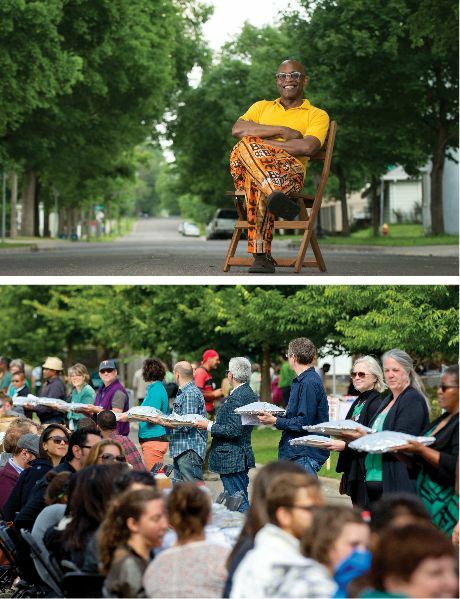 For example in late 2014, artist Seitu Jones masterminded Create: The Community Meal, an outdoor table set up along St. Paul Frogtown’s Victoria Street, so 2,000 people could gather to share a locally grown and prepared meal and learn about food disparity. 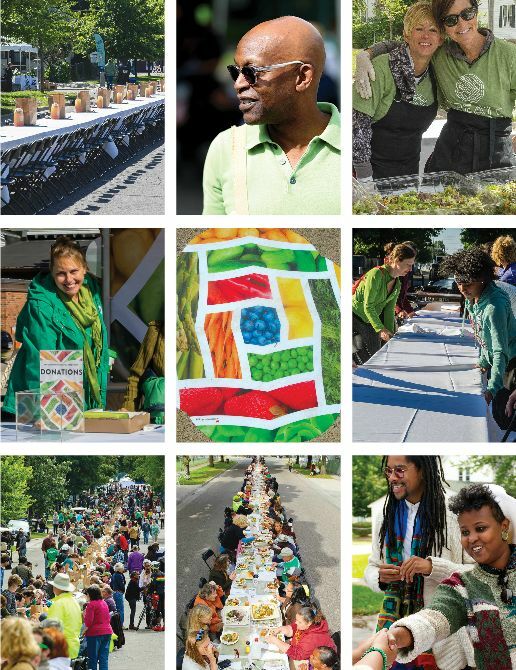 The meal, served on a perfect September day, involved artists in its creation, presentation and service, while also adding spoken word and performance elements to the celebration. According to the State Department of Agriculture’s 2015 Profile, Minnesota’s agricultural exports are $7.35 billion, almost twice as much as the next closest industry. We’re fifth among the 50 states in the total dollar volume of our ag economy, with crop and livestock production split almost evenly. Heading out of the metro area, you won’t go far before seeing farms dotting the rolling hillsides and fields filled with corn and other crops. So why is it that many residents in our inner cities cannot buy a loaf of bread or a quart of milk within a reasonable walking distance of home? According to the USDA, a food desert is defined as a low-income census tract where urban residents have to travel more than a mile to a grocery store and rural residents lack a grocery store within 10 miles of home. Minnesota is covered with these deserts, in both rural and urban areas. A coalition of Minnesota grantmakers is working to change these conditions and eliminate barriers that prevent low-income Minnesotans from eating healthy food. Medical research has long documented the links between healthy eating and the occurrence of chronic and other disease. Low-income communities have lower health outcomes in part because they lack access to healthy food, nutrition information and food skills, and to a work and living environment with an equitable food infrastructure. In 2014, several hundred Minnesotans came together in public meetings and events to co-create and publish the Minnesota Food Charter, which details 99 strategies for improving Minnesota’s food systems. According to the Minnesota Department of Health, diet-related chronic disease costs Minnesotans $2.8 billion annually. Hunger-Free Minnesota puts the cost of hunger at $1.62 billion annually in preventable direct and indirect health and education expenses. Food charter advocates aim to build a culture of health by investing in a stronger and more just food infrastructure, and by lowering the cost of treating health consequences of food inequities. The charter is designed as a shared road map with many entry points, so nonprofits, businesses, grantmakers and tribal agencies can find ways to connect with one or more of its strategies. Locally, grantmakers such as Blue Cross and Blue Shield of Minnesota Foundation and Greater Twin Cities United Way have been closely involved in the development of the Food Funders’ Network. Alison Babb, senior health improvement project manager at Blue Cross, says the network is actively seeking members and is open to funders, advocates and other stakeholders interested in hunger, health and health equity. United Way actively participates in the Food Funders’ Network,and has aligned its grantmaking with the Minnesota Food Charter. United Way is particularly interested in food accessibility and food skills. Megan O’Meara, director of community impact at United Way, offers Pillsbury United Communities’ Community Cafes and Food Shelves, located in North Minneapolis, Cedar Riverside and South Minneapolis, as an example of local grantees. Artist Seitu Jones describes Create as, “One wave in a sea of change that engages and builds community networks, brings forward artistic experiences and works deeply within the food system.” And it did more than that for those present: it embodied the ways we’re all in this together. Everyone eats. The Minnesota Food Funders’ Network was formed in 2011 when grantmakers with common concerns of hunger, health and health equity came together to learn and act. For more information about the Minnesota Food Funders’ Network, contact the Minnesota Council on Foundations and sign up for the group’s email announcements.